5-year-old Maya Hughes poses the day she left Sierra Leone. Maya’s mother, Zainab Sesay, brought the pair to the West African country in 2003 to reconnect with their roots and introduce Maya to her great grandmother. Zainab Sesay wasn’t afraid of adventure. Born in Sierra Leone, she immigrated to the United States when she was 11. But she always felt a connection to her homeland and the family she left behind. In 2003, she decided to return. Leaving the U.S. wouldn’t be easy. Zainab had a career. Friends. A family. “I was working with Northrop Grumman at the time,” she told VOA. It was the best company she would ever work for. She was in her mid-twenties and had a good life. But something was missing. So she gave up what she knew. “It was a very daring move, to say the least,” Zainab said. She had another reason to return to her home. Zainab wanted to reconnect with her grandmother, and she wanted Maya, her 5-year-old daughter, to meet her. “The trip was solely to take her back to learn of my heritage and my background,” Zainab said. So the two boarded a plane and, with no planned return date, left the lives they knew behind. It was Maya’s first experience in such an unfamiliar place. And Zainab wasn’t prepared for how much her country of birth had changed. 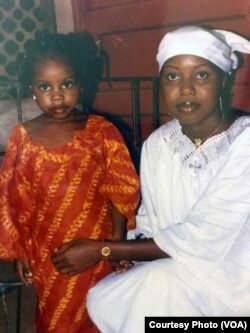 Maya Hughes, left, and Zainab Sesay pose during their time in Sierra Leone. A medical emergency forced Maya to leave the country a month before Zainab. They later reunited in the United States. Suddenly, five months into their stay, Maya and Zainab’s adventure took an unexpected turn. Maya had a medical emergency and needed to be flown back to the United States, immediately, to see a pediatrician. Zainab couldn’t accompany her on such short notice, but she was determined to get Maya to the U.S.
Any state would do — Zainab’s mother and then-fiancé could travel anywhere to pick Maya up. The catch was finding a trusted adult to accompany her. Many airlines allow children as young as 5 to fly unaccompanied, but they often require itineraries for direct, nonstop flights. Getting Maya to America wouldn’t be so straightforward. Zainab needed a passenger’s help. At Lungi International Airport, Zainab approached strangers. “Is anyone traveling to America? Can my daughter accompany you?” Zainab pleaded. Eventually, Zainab talked to a representative with Brussels Airlines. At first the agent didn’t answer. Disclosing that information was against policy. Sensing Zainab wouldn’t relent, she motioned to a 28-year-old American sitting nearby, with a warning: He’s traveling to the U.S., the agent told Zainab, but he’s probably not in the best emotional state to chaperone a minor. Tom Perriello had seen humanity at its worst. Born in Charlottesville, Virginia, he attended Yale and, after earning his Juris Doctor degree, traveled to Sierra Leone, where he worked for the prosecutor on the Special Court for Sierra Leone. The tribunal had been established in Freetown, in 2002, to oversee prosecutions of individuals accused of war crimes. The country had suffered terribly during a brutal, decade-long civil war. 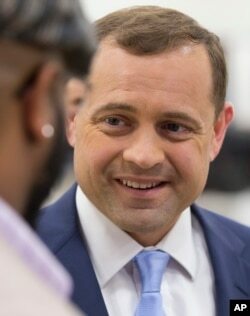 Tom Perriello speaks to supporters after a Virginia gubernatorial debate in 2017. Perriello ran for the Democratic nomination but lost to then-Lieutenant Governor Ralph Northam. He later stepped into a senior leadership position with the Open Society Foundations. On this day, Tom was mourning a personal setback. He had received bad news from the U.S.: His maternal grandmother, his only living grandparent, had died. He was traveling home to attend her funeral. Suddenly, a woman appeared in front of him. Tom was skeptical. Trafficking scams weren’t uncommon. And that was the last thing he wanted to be caught up in at this moment. He declined and explained the reasons for his travels. But the woman continued pleading. He looked at the mother and her daughter. He knew this wasn’t a trick. They needed him. Zainab’s frenetic state began to settle as she watched Tom and Maya board the plane. Her thinking was clouded, but there was no way to take back her actions now. Around 2:30 a.m. the next morning, Zainab awoke to a frantic call from the United States. It was her mother, and she had upsetting news. In Abidjan, Côte D’Ivoire, Tom and Maya had been stopped. Tom didn’t have proper documentation, Zainab’s mother explained, and he couldn’t continue to travel with Maya. He had 24 hours to prove he was allowed to accompany her; otherwise, she’d be returned to Sierra Leone, undoing Zainab’s risky plan. The paperwork they wanted was straightforward. But in Sierra Leone, Zainab had no access to faxes or email. But Maya’s grandmother was able to procure the paperwork from the U.S., and she sent a letter to appease the airline. “I was freaking out,” she said. She couldn’t sleep as she waited for a call back. Hours later, the ordeal ended as quickly as it began. Zainab’s mother called with good news: Maya and Tom were allowed to continue. They left Africa and made it all the way to Dulles International Airport, in Virginia, where Zainab’s mom drove to pick up Maya. Tom dropped her off, and Zainab’s mom gave him a hug before he walked out of their lives. Zainab never knew the name of the man who helped her daughter. Over time, his face faded from memory. She wanted to reconnect, but she had no leads to follow. “It’s as if I was searching for an unknown person,” she said. The years passed, and Zainab and Maya re-established their lives in the U.S.
Tom’s career as a politician, diplomat and advocate flourished. He became a U.S. Congressman in 2009, serving Virginia’s 5th district. He’s now the executive director of the Open Society Foundations’ U.S. Programs. “He is, by far, beyond any human being I’ve met,” Zainab said. Maya flourished, too, and now lives in California. She shared her story on Twitter this month, and talked about the recent reunification. It was just this month that Zainab learned Tom’s identity. Both sides had told their story to friends and colleagues. Eventually, a shared connection put them in touch. In a recent letter, Tom told Zainab details she never knew such as the songs he sung to Maya while they traveled together. And, how he missed his connection after landing at Dulles International Airport, in Virginia, never making it to his grandmother’s funeral. “I was so saddened,” Zainab said, learning about his sacrifice. For Tom, the reunion couldn’t be happier. Tom and Zainab have communicated in recent weeks. But they haven’t met face-to-face since their fateful encounter at Lungi International Airport 15 years ago. Salem Solomon is a multimedia digital journalist with the Voice of America’s Africa Division. She covers the latest news from across the continent, and she also reports and edits in Amharic and Tigrigna. Salem’s multimedia and data-driven projects include How Western DRC’s Ebola Outbreak Was Contained, Unrest: Ethiopia at a Crossroads, Zimbabwe in Transition, Hunger Across Africa and How Long Have Africa's Presidents Held Office? Her work has appeared in The New York Times, The Washington Post, Poynter.org and Reuters. She researches trends in analytics and digital journalism. For tips and inquiries, email: salemsolomon@voanews.com.